In this thread I'm going to take another stab at building a Synergy Home for my home. I've built some Unity horns for my car, but have never finished one for home use. I had another project that died on the vine about a year back, and this project will attempt to address some of it's shortcomings. 1) From my car projects, I've learned that using existing boundaries can allow one to make horns much much smaller than what would be "ideal." The typical solution is to use the corner of a home. I have tried corner horns, and I do not like the 'headphone' effect. Basically corner horns have no reflections, and that makes them sound a bit uninvolving, like a giant set of headphones. But there's another way to use boundaries which will be utilized in this project. 2) I really think that Geddes is on to something with his research that indicates that diffraction and higher order modes are two of the things that make horns sound bad. At the same time, these things can be problems in Synergy horns, because of the midrange taps and a lack of termination on the horn. 3) The last thing is cosmetics; my reference speakers are currently banished to my bedroom due to their size. So I'm hoping that this project will have a smaller footprint and also a look that's avantgarde enough to make it back into my living room. Here's a picture of the proposed speaker. 1) The main one is that the slope of the woofer enclosure can be used to reduce diffraction from the horn. You'll see this in a moment; basically with some manipulation of the horn shape we can create a seamless blend of the curve from the horn to the rest of the enclosure. A seamless transition is important because it reduces diffraction. 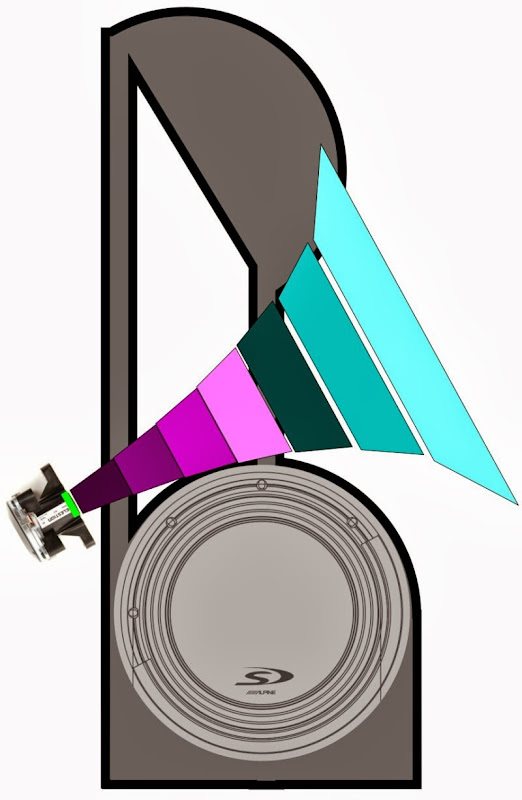 Reducing diffraction makes the speaker more listenable, reduces horn honk, and makes it image better. 2) Another innovation is stolen from the Gradient Helsinki. 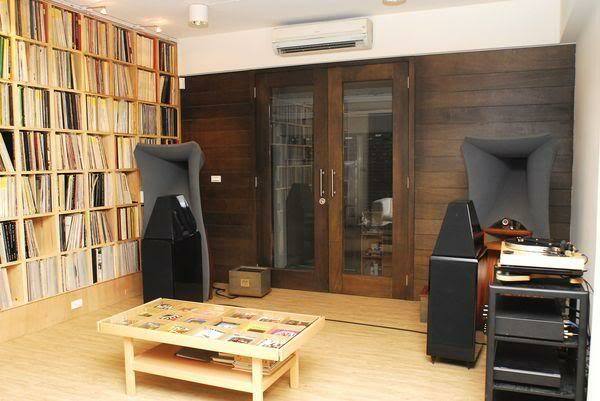 I haven't heard many speakers that throw a bigger soundstage than the Helsinki, and I think part of their soundstaging ability is that the main lobe of the loudspeaker is aimed at the ceiling above the listener. By doing this, early reflections off of the floor and ceiling are delayed in time. Gradient does a better job of explaining this than I do, but the basic idea is that a regular speaker has a symmetrical floor and ceiling bounce in FRONT of the listener. The Helsinki has a ceiling bounce, but the ceiling bounce happens later due to the angle of the drivers. So my Synergy horn does the same thing; the main lobe is aimed right at the ceiling, and we're basically listening off axis. A side benefit of this is that it makes the speaker very short, which looks good, and it allows me to put loudspeakers beneath my home theater screen instead of behind it. By doing that I avoid the 'headphone' effect that happens with speakers behind a home theater screen. 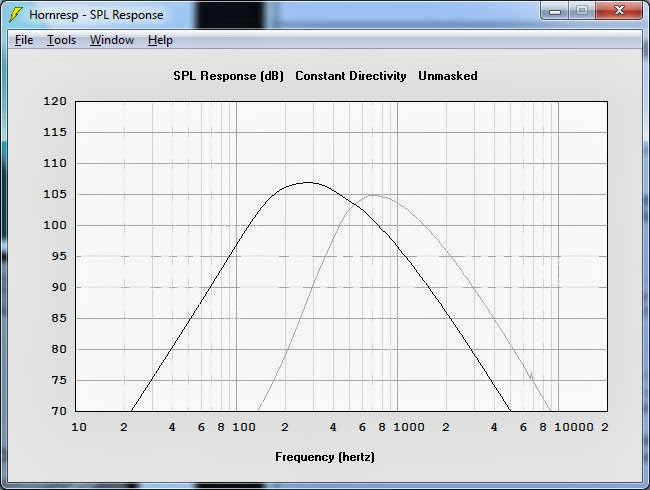 Here's the predicted response of the compression driver and midranges of this horn. At the moment, the horn curve is LeCleach. Normally I would avoid LeCleach because the beamwidth is very narrow. But what I've found from my experiments in diffraction reduction is that the beamwidth of the horn grows broader when you use a very very large roundover. For instance, when you put a 6" roundover on the horn there's a significant amount of energy that's radiated all the way out to even 180 degrees, even if the horn throat is only forty degrees. So we can use the roundover to both reduce diffraction and widen the directivity. Basically the way that this works is that diffraction off of an abrupt horn termination basically stops radiation at the edge of the horn mouth. 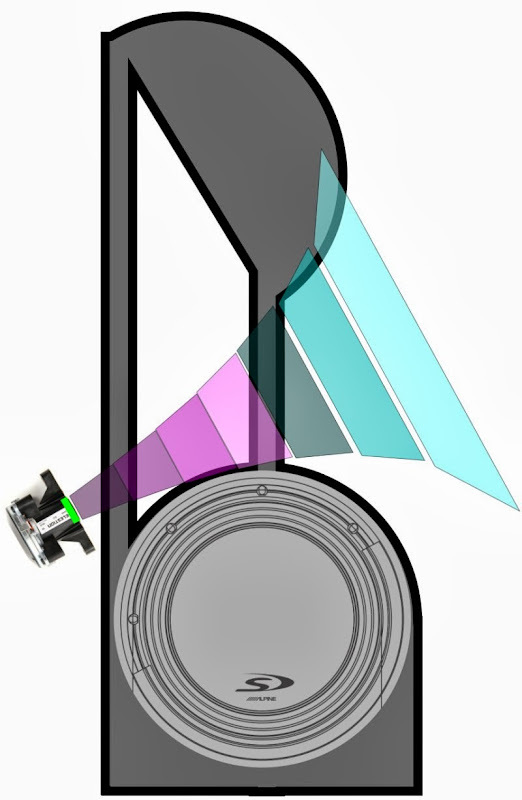 But add a big roundover and the sound exiting the horn mouth is gently and slowly radiated into a wider beamwidth. Here's a picture illustrating what I mean, about using the enclosure shape to extend the horn curve. In this case, there's a gi-gan-tic roundover at the mouth of the horn, a full six inches on the top *and the bottom. The roundover shape mimics the existing curve of the LeCleach horn; basically the idea is to shorten the horn, then bond it to the enclosure so that the enclosure itself extends the curve. While it's true that I could simply build the LeCleach horn, and set it on top of the enclosure, I think that looks a bit clunky. I'm hoping to make this enclosure look sculptural while still being functional, similar to the Jadis Eurythmie and also the Synergy proposal that was posted earlier in this thread. The big roundovers are made with plain ol' sonotube. 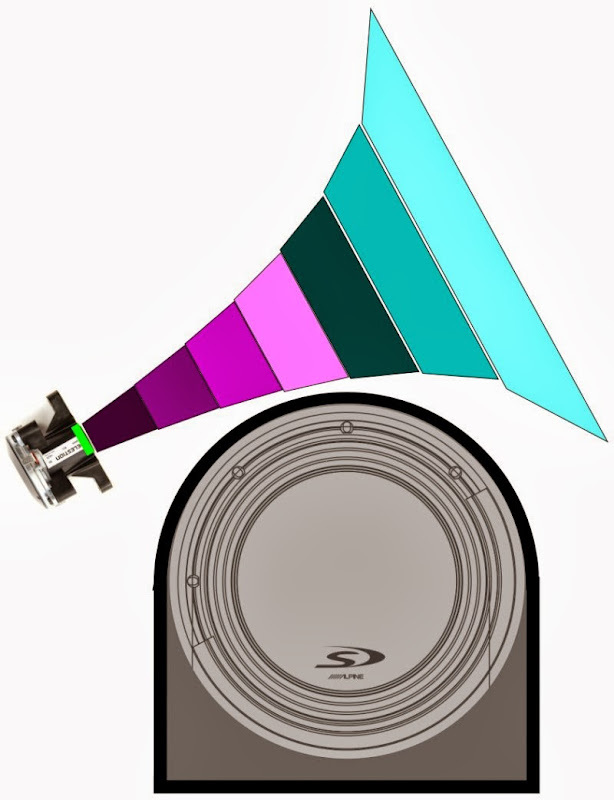 I would consider a roundover that's even larger, but Home Depot only goes up to 12"
Here's a pic of the same speaker, but with transparency on the horn body, to better illustrate how the speaker enclosure extends the curve of the horn. 2) midrange: Dayton ND91 x 3, 180hz - 1500hz. This is the driver most likely to change, as I'm not sure if I can get them to cover a bandwidth that's this wide. 3) Woofer: Alpine SWS-10D2, 38hz-150hz. I'm going to run this off of my sub amp. I already have two subwoofers in the room, so this will basically act like a subwoofer that happens to be nearby the mains. The reason I can have the driver aimed off axis is that the wavelengths are so long at 150hz, it doesn't matter if it's facing forward or sideways. I'm hoping to do first order slopes on the midrange and tweeter using MiniDSP; while this would normally be quite aggressive for such a small compression driver, I've found that the CDX1-1425 can take quite a bit of abuse and I've run it with first order slopes before. The efficiency on the horn doesn't hurt either. I'm not really getting the ceiling reflection thing though. You're going to build highly directive speakers that mostly avoid the floor and ceiling reflection problems but you are going to aim them to get a reflection above you? Did you try it with the Summa's placed on the floor and aimed at the ceiling above you? Seems to work for Gradient. Their papers explain it better than I can - you really have to hear them. Gradient admittedly uses a waveguide with a much broader pattern than mine. Haven't tried it with the Summas, but I should. You are either crazy or genius, probably both. The pathlength from tweeter -ceiling-ear is the same with tilt or without. Tilting reduces floor reflections effectively (larger angle) but sidewall reflections are almost same. The relative proprotions of reflections from different surfaces changes. Generally I like the idea of tilted midrange horn!